The Usambara Effect, Color Change and Color Shift. Overlaid tourmaline crystals demonstrating the Usambara effect. Calcium bearing dravites containing chromium and vanadium from the Umba Valley in Tanzania. Early in the 1990's in the remote Nchongo area of the Umba Valley located in the shadows of the spectacular Usambara Mountains of Tanzania, Norwegian geologist Asbjørn Halvorsen collected beautiful chromiferous green tourmaline which displayed a remarkable color change effect. In 1997, in collaboration with Brenda Jensen of the Mineralogical Museum of Oslo, the first paper appeared characterizing this phenomenon which they suggested be named the "Usambara effect" (UE). This work attracted the attention of Dr. Kurt Nassau, author of The Physics and Chemistry of Color, who contributed further insights into the phenomenon and included their work in the latest edition of his book. More papers have followed in which Asbjørn explores the Usambara effect's nature along with the complex interactions which contribute to color change phenomenon. Historically the Umba Valley area of Tanzania has produced some of the most extraordinary gemstones found to date. The unique geology of the region has led to relatively high concentrations of the transition elements chromium and vanadium to which in part the gems owe their rare and fascinating optical properties, including extraordinary color and phenomena - not just the better known alexandrite chrysoberyl, but also color change garnets, tourmalines and sapphires. So, while it comes as no surprise that a chrome tourmaline from the area might show a dramatic color change, the nature of this particular tourmaline was something all together new. Asbjørn Halvorsen shared with me insights of which some follow below in this brief overview of the Usambara effect. 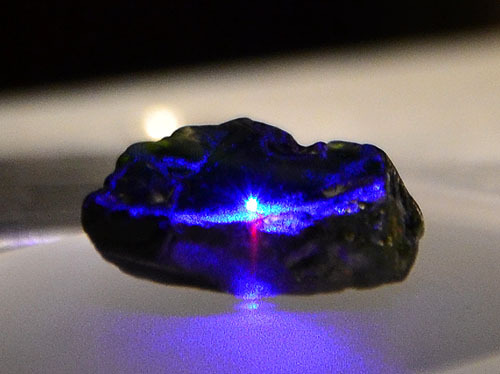 The Usambara effect describes a color change dependant not on the type of illumination (as with the so-called alexandrite effect), but rather on a change of path length of light through the gem material in a single orientation. As with the alexandrite effect, there is an approximate balance of transmitted wavelengths in the red and green areas of the visible spectrum reaching one's eye. Minerals of this type are said to have dichromatic transmission spectra. In alexandrite effect color change the type of illumination tips that balance; if the illumination is stronger in the red wavelengths as with candle light, red becomes the perceived color. In daylight which is stronger in the green wavelengths to which the eye is much more sensitive, the perceived color is green (see spectral curves). The Nchongo chrome tourmalines are a verdant green in both transmitted and reflected light. Once the thickness of the mineral reaches a critical point, dependant on concentration of the elements chromium and vanadium, the perceived color of the transmitted light suddenly shifts to red (see transmission curves). This occurs viewing either the ordinary or the extraordinary ray at about the same thickness. "A crucial condition in regard to the Usambara effect is that the increase in absorption is higher for the higher frequencies than for the lower (remember: higher frequency means shorter wavelength of visible light). With increased path length, the intensity of the red transmission is increased relative to the intensity of the green, and thereby the balance between the green and red transmissions is shifted towards red, a shift that can be observed as relatively sudden (Halvorsen, 2006)." The rough, uneven crystal in the photo at right dramatically illustrates this. UE chrome tourmaline in transmitted light. the critical thickness change-over point. and a deep green UE tourmaline crystal fragment. Photo courtesy of Asbjørn Halvorsen A fascinating aside to the Usambara effect in tourmalines involves chlorophyll, the pigment found in plants. 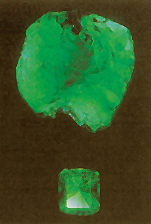 A chlorophyll solution will appear green in transmitted light up until a critical depth when it will change to red (in the image below, depths are green 5mm and red 15mm). 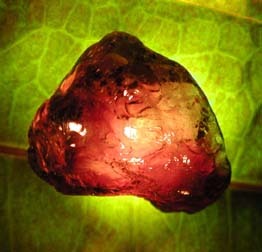 Several layers of green leaves will effectively act as a color filter and cause this same effect in the UE deep green tourmaline when illuminated from below with a fiber-optic light as seen in the photo to the left. 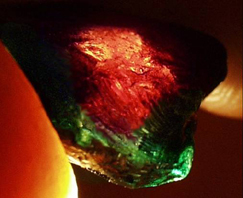 Path length not only pertains to the thickness of the gem, but also may be involved in the flashes of red observed in the chrome tourmalines. When light enters a faceted stone some rays may leak out the bottom, but if the angles of the facets are correct, most will bounce internally from facet to facet to eventually exit the table and reach the eye. This internal reflection is effective increase in path length and may explain these observed red flashes. Furthermore, another observation arising from the study of the UE tourmalines is that of "absorption modified dispersion." Dispersion is the "fire," or small glints of colors one sees in colorless stones such as diamond. It is the progressive refraction of white light into a rainbow of spectral colors. 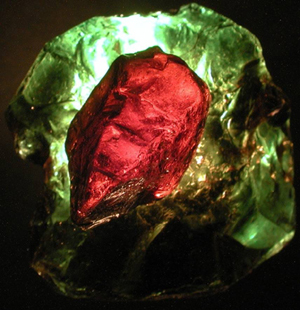 In a colored stone, these are masked by the body color, but can still be seen in high dispersion stones such as sphene.In a mineral with two equal transmission windows such as the UE tourmaline, there are two windows of dispersion: "red dispersion rays escape through the red transmission window, and similarly green dispersion rays through a green dispersion window. Any other dispersion colours are trapped by absorption (Halvorsen, 2006)." Absorption modified dispersion in the UE tourmaline. 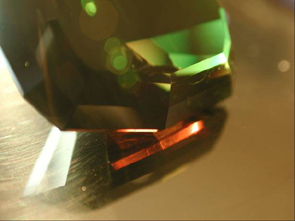 In the photograph at right, red transmitted light is shown in the reflection below an 18 ct faceted UE chrome tourmaline. 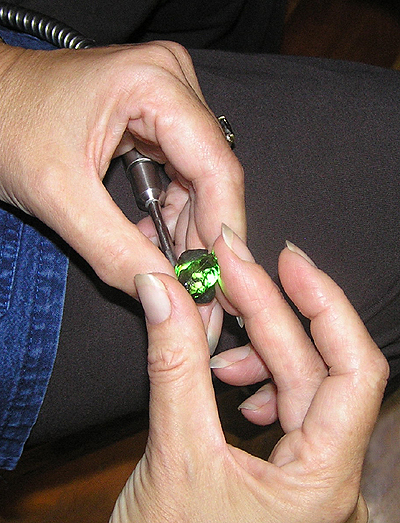 The face-up color displays green internally reflected light (this stone is illuminated by bright sunlight and rests on a sheet of polished silver to reduce static electricity). In the 1984 winter issue of Gems & Gemology, Manson and Stockton of the GIA coined the term "color shift" to describe a change in color caused by transmitted light versus that of internally reflected light, without a change in illumination, as observed in color change pyrope-spessartite garnets. It is quite possible that this color shift can be explained by a combined interaction of Usambara effect and absorption modified dispersion. Reflected light and mirror image of transmitted light. An interesting note about these Nchongo tourmalines is that they may show two pleochroic colors perpendicular to the c-axis and a third color when viewed parallel to the c-axis. Tourmaline is a uniaxial mineral which by definition can only show two pleochroic colors (only biaxial minerals may show 3 pleochroic colors). It was noted that while there are biaxial tourmalines on record, the Nchongo tourmalines exhibit the distinctive uniaxial optic figure when viewed between crossed polars, proving its uniaxial nature. This is part of what led to the inquiry which resulted in the characterization of the phenomenon called the Usambara effect. "Color change in minerals is complex and its understanding requires a holistic approach (Halvorsen, 2006). "All color change effects depend on multiple influences. Alexandrite, a variety of chrysoberyl, is strongly pleochroic. It's color change effect is dramatically affected by crystallographic orientation; the face-up color change is most dramatic when light is travelling parallel with the a-axis (in other words the table of the cut gem should be perpendicular to the a-axis). In the above mentioned pyrope-spessartite color change garnets, fluorescent light (rather than incandescent light) produced the most dramatic color shift change between transmitted and internally reflected light. Similarily, the Usambara effect is mildly modified by pleochroism and crystallographic orientation, but it is the path length of the light which is the dominant factor. The Usambara effect has since been observed in several other gem materials such as corundum, garnet, kornerupine, epidote as well as alexandrite. Above photos and intellectual property copyright © Asbjørn Halvorsen. Liu, Y. and Shigley, J.E. and Halvorsen. A. (1999) Colour hue change of a gem tourmaline from Umba Valley, Tanzania. Journal of Gemmology, Vol. 26, No. 6, pp. 386-396. Halvorsen, A. (2006) The Usambara effect and its interaction with other color-change phenomenon. Journal of Gemmology, Vol. 30, No. 1/2, pp. 1-21.
for your generosity and delightful correspondence! Postscript: I have been given the incredible opportunity to personally study these tourmalines. This is quite an honor for which I have Asbjørn to thank. After having the orginal Usambara Effect tourmalines for more than a year and sporadically being able to study them with Asbjorn's guidance, they were returned home to him in Norway in 2009. I was able to collect some specimens of my own which show the effect. These were provided to me by Brad Payne, The Gem Trader and have been great fun since. In Spring of 2011 I received a wonderful gift from Asbjorn, six specimens of the original tourmalines, including two faceted stones. 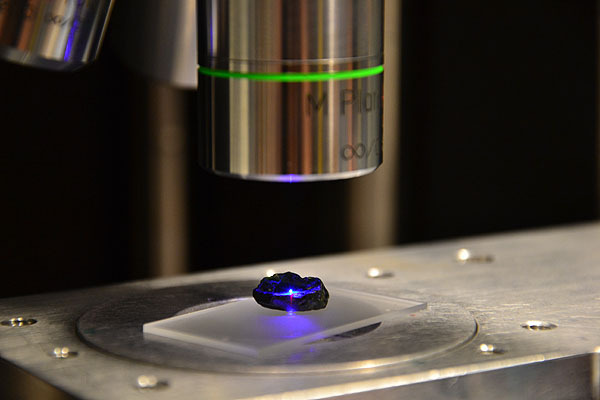 The UE tourmaline under the Raman's 458.56nm blue laser. A bright red florescence tracks the laser's path through the crystal. The images above show the view looking down the c-axis of a crystal fragment and a faceted stone. In the lower one, they are stacked together without changing the orientation.